Our first Cool Aeronautics event of 2019 has begun! 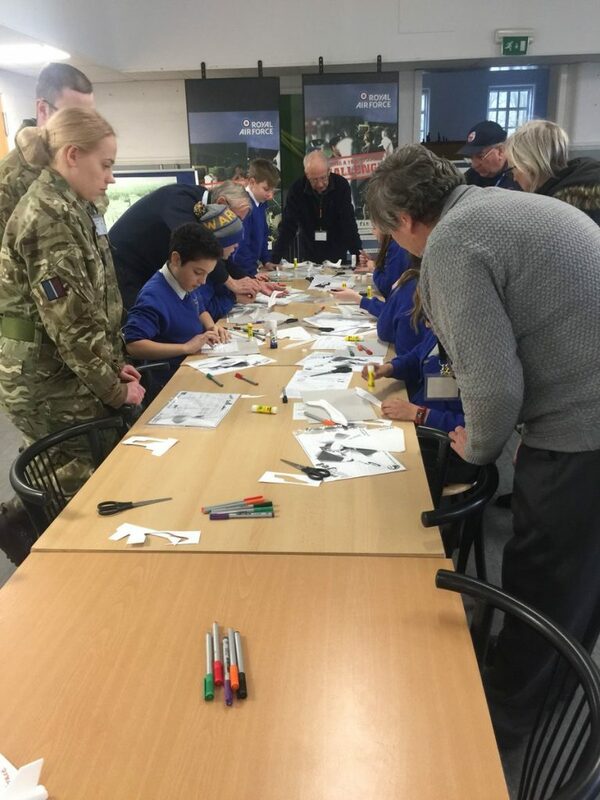 Our wonderful friends at the Trenchard Museum at RAF Halton welcomed 75 children along with their teachers from Bledlow Ridge School and High Wycombe CofE School to come and learn about all things Aerospace with a focus on STEM related activities. 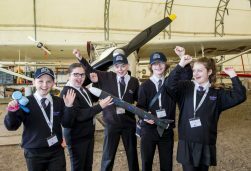 The Trenchard Museum is working with the Royal Aeronautical Society to promote aerospace and aviation to a new generation under the STEM umbrella! 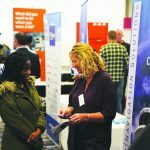 Cool Aeronautics events are free to attend and offer a fantastic opportunity for young people to meet inspirational people from across the industry and to engage with aerospace themed activities that are relevant to the current KS2 Curriculum. The Society would like to say a bight thank you to Bill McGrath, our Project Leader from the Trenchard Museum for kicking off the 2019 events with a fantastic day for the schools! The children were split into six groups and took part in six different activities throughout the day at various locations around the station. In one activity the children were briefed by pilots of the Halton Aero and Microlight Clubs including Mike Russel and Dave Scott, on the principles of flight and given the opportunity to sit in a light aircraft as the pilot. They also experienced a map reading activity using grid references and communicating using hand held radios and introduced to Morse Code under the guidance of the London & South East Air Training Corp Communications Officer, S/L Malcolm Wood and Halton-based Jon Savidge and Cpl Craig Turner and their colleagues. To name a few…..
With such a variety of activities throughout, it was a pleasure to see big smiles on the children’s faces throughout the day and receive such positive feedback! 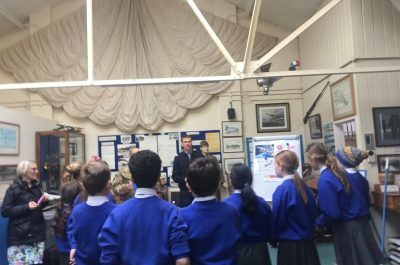 “I just wanted to send you a quick note straight away to let you know how much the children from Bledlow Ridge School enjoyed their day at RAF Halton today. Even after the first 2 sessions children were agreeing with each other that this was the “best trip ever”! By the end of the day they all had different favourites, but the practical making workshops were especially popular. 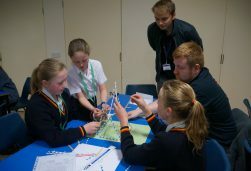 The wide range of activities and experiences helped them to see real-world connections between different school subjects and gave them different ways to learn and apply their learning. They appreciated having so many adults to help them engage and explain things they weren’t sure they’d understood. Meeting young people just starting out on their careers was another bonus that really developed their “science capital”, inspiring and encouraging them to think about future careers previously out of their experience”. “A huge thank you to you and all your colleagues who made today such a wonderful experience for all our Year 5 children, they had an amazing experience. Many of the children said it has been the best school trip ever! The children and I really appreciated the time and effort everyone put into making the day a superb learning experience. They thoroughly enjoyed all the practical aspects today the day including the rocket building and launching; model plane making and flying; the opportunity to sit in a plane; the icing on the cake was the unexpected goodie bag that the children received at the end of the day. We would love to share this experience with other children in our school, if you were willing to accept us if you were running an event like this again next academic year”. After reaching over 1,800 children in 2018, our Cool Aeronautics programme is now in full swing for 2019. 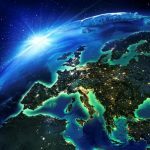 With many confirmed locations across the UK and for the first time Cool Aeronautics has gone transatlantic! With our first events in Canada and the USA the team are very excited for the future and look forward to bringing the programme to more exciting locations around the world.